What is the Litter Letter Project? This project began as a personal response to the litter collected daily in front of my property along the highway in Louisiana. As a designer and educator with a deep love of 3D typography, I created a series of prototypes to test the idea of using the litter as the message. Following several community workshops and sharing this idea with a wider audience this project was awarded a generous grant from Keep Louisiana Beautiful (affiliated with Keep America Beautiful). Together as a community we created 7 litter letter words that were displayed in several locations around WASHINGTON PARISH, LOUISIANA throughout 2013. Since then The Litter Letter Project has been adopted by many communities and organizations across the USA and the world. 2014 ~ Keep Sevier Beautiful in PIGEON FORGE, TENNESSEE created their own version as part of their litter awareness month. Keep Phoenix Beautiful incorporated The Litter Letter Project into the day of action for day 3 of the Clinton Global Initiative University conference. Colorful letters filled with recycled materials were created for the PHXRENEWS site in downtown PHOENIX, ARIZONA. 6th Avenue Corridor/Keep Iowa Beautiful created the words THINK, HOPE and CARE in DES MOINES, IOWA and The Cultural Alliance of York County partnered with the community of YORK PENNSYLVANIA to create an amazing CHANGE. In the fall of 2014, LAFAYETTE, LOUISIANA created the tallest Litter Letters to date. Standing at 8 feet tall #YARDWORK was part of the parish wide Project Frontyard initiative. 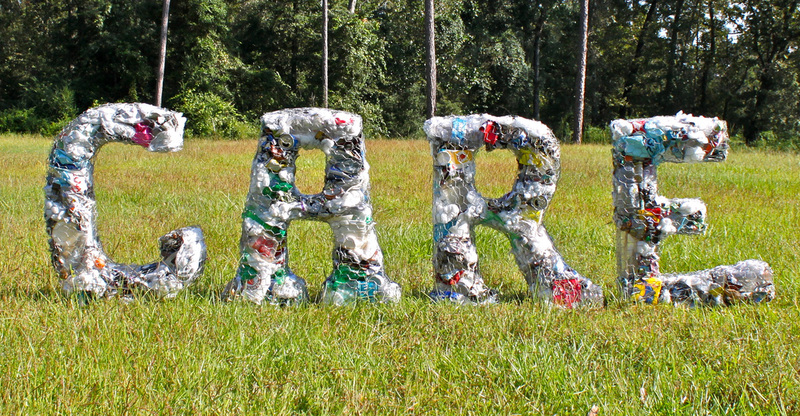 2015 ~ Keep West Baton Rouge Beautiful became the 3rd region in Louisiana to create Litter Letters displaying WHY? in the state capital of BATON ROUGE. Keep Sevier Beautiful debuted their second word of THINK recently in PIGEON FORGE, TN and Keep Iowa Beautiful created the word DREAM making this the 4th Litter Letter installation in DES MOINES. A second region in Pennsylvania created the word PRIDE in downtown COLUMBIA. LANCASTER became the third region in PA to create Litter Letters debuting their RETHINK letters in October 2015. 2016 ~ Keep Sevier Beautiful continued their Litter Letter Projects debuting their 3rd annual word – PRIDE in March in PIGEON FORGE, TENNESSEE and the community of DES MOINES, IOWA produced their 5th Litter Letter project, also the word PRIDE. Keep Chadron Beautiful created WHY in May 2016 making NEBRASKA the 6th state to adopt the idea! A large traveling recycle symbol Litter Letter ♻️ debuted in PITTSBURGH, PA forming part of Allegheny CleanWays and PRC’s larger "Northside's keep it clean" campaign to fight litter and increase recycling in Pittsburgh’s Northside neighborhoods and became the 4th city in PA with Litter Letters. The Litter Letter Project went INTERNATIONAL when the community of Swan Valley in PERTH, WESTERN AUSTRALIA created Litter Letters that spelled out WHY? and then the city of ALBANY created REUSE and RECYCLE! 2018 ~ Mesker Park Zoo & Botanical Gardens in EVANSVILLE, INDIANA debuted their ZOO Litter Letters for their party for the planet on Earth Day! Indiana is the 9th US state to adopt the project! The ReThink Litter Letters made in Lancaster, PA in 2015 continue to be recycled and were put on display at Ecore International for their Earth Day events. The WHY? Litter letters created in Perth, Western Australia in 2016 continue to be used for events and were recently refilled and put on display in a new location in the city. CALIFORNIA became the 10th state to adopt the Litter Letter Project creating CARE in the city of San Bruno. In October 2018 INSPIRE litter letters were created in Pikes Peak, COLORADO SPRINGS, COLORADO #TrashFreeDC Litter Letters also debuted in WASHINGTON DC and currently on display in Anacostia National Park for the Year of the Anacostia. ​For those interested in learning how this project began and how it has spread across the world please check out my TEDx talk: https://www.youtube.com/watch?v=uAi0yvfPD4w&t=784s The project continues to grow as more communities create their own version of this idea. Watch this space for updates and follow #litterletters #thelitterletterproject on Facebook, Twitter and Instagram.